Alvin Mitchell (back row, left to right), Don Duerr, Kelly Tegeler, Ron Ruckman, Loren Racich, TJ Hunt, Festus Krause, Christi Krause, Richard Thomas (front row, left to right), Ben Franklin, Dave Viebrock, Cody Roberts, Gloria Thomas and Joe Sampson all attended training at the Mid-Winter Fire School at the Wyoming Fire Academy in Riverton Jan. 3-6. 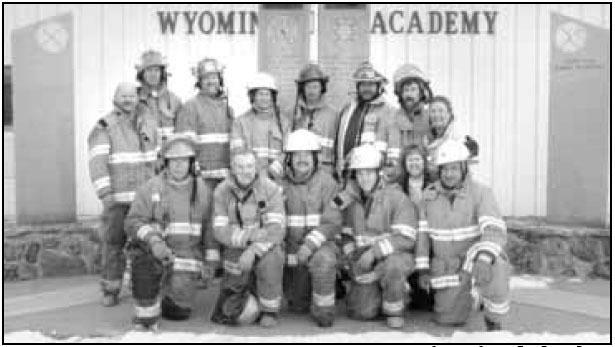 Thirteen Sublette County volunteer firefighters recently completed the training necessary to receive their Wyoming Firefighter II (FFII) Standard Pro Board Certification while three received Firefighter I (FFI) certification and 21 additional firefighters are taking the class to become Wyoming State certified. The 13 Sublette County volunteer firefighters attended the Mid-Winter Fire School at the Wyoming Fire Academy in Riverton Jan. 3-6 where a number received their Pro Board Certification. “Those of us who become Pro Board certified have taken an added interest and time to show people that the volunteers are doing the samethings the professionals are doing,” Sublette County Fire Warden TJ Hunt said. Hunt said volunteer firefighters can attend such training in a number of cities across the state, but the Sublette County volunteers chose Riverton due to the fact that Riverton was conducting its annual fire school and a number of the Sublette County volunteers were already over there anyway. Pro Board Certification is a national accreditation program that allows individual firefighters and emergency first responders to meet professional national standards for their respective fields. Upon certification, individuals have their names placed in a national database. Pro Board Certification is similar to the “Red Card” system that has been used by the U.S. Forest Service for years for recruiting help for wild land fires. Pro Board Certification creates a standardized testing and national accreditation system for structure firefighters. The need for the standardized qualification system became apparent after the 9-11 terrorist attack in New York and Hurricane Katrina natural disaster in New Orleans. 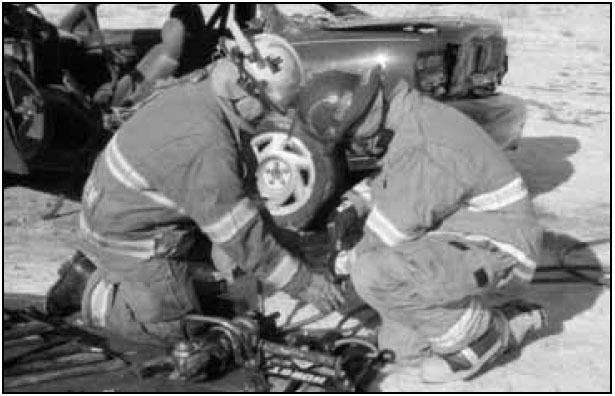 Daniel volunteer firemen Loren Racich (right) works with a class teammate to demonstrate the evolutions to extricate an entrapped victim. Ten firemen from Sublette County received FFII Pro Certification in Riverton, including Daniel Fire Department volunteers TJ Hunt (Sublette County Fire Warden), Chief Ben Franklin and Lt. Loren Racich; Pinedale Fire Department volunteers Chief Alvin Mitchell, Assistant Chief Ron Ruckman, Lt. Don Duerr and Lt. Kelly Tegeler; Bondurant Fire Department volunteers Chief Richard Thomas and David Viebrock; and Kendall Valley Fire Department volunteer Chief Festus Krause. A person certified at the FFII level has demonstrated greater competency in the necessary knowledge and skills to function safely and effectively as a member of a firefighting team under general supervision. Firefighters have to have certificates for training in vehicle rescue and hazardous materials operations. They are trained and tested in the areas of fire behavior, building construction, fire department organization, fire alarm and communications, water supplies and sprinklers, ropes and ladders, ventilation, foam fire streams, fire control andother areas. Three firemen from Sublette County received FFI Pro Board Certification in Riverton, including Cody Roberts, Daniel volunteer firefighter, Joe Sampson, Kendall Valley firefighter and Eric Schneider, Bondurant volunteer firefighter. A person certified at the FFI level has demonstrated competency in the necessary knowledge and skills, while working under direct supervision, to function safely and effectively as a member of a firefighting team. They are trained in emergency medical care and hazardous materials awareness, as well as fire behavior and control, fire alarm and communication, forcible entry, ropes and ladders, rescue, sprinklers and many other competency areas. Simply going to Riverton for testing isn’t all it takes to become Pro Board Certified. According to Hunt, in order for a volunteer firefighter to become Pro Board Certified the firefighters first must complete training through a task book, then take written exams and send the information into Cheyenne. The name of the firefighter submitted to Cheyenne then requests a spot skill test. If that is accepted the firefighter attends training (in this case in Riverton) where three random tasks are selected for the firefighter to performin front of testers from other fire departments across the state. Hunt said it is a pass/fail test. Volunteer firefighters taking the class include Kendall Valley Fire Department volunteers Christi Krause (FF), Antor Kolis( FF), Mark Weber (FFI), John Doak (FFI), Don Sell (FF), Joe Sampson (FFI), Jeff Piros (FFI), Shawn Piros (FFI), Jeff Debenport (FF), Jim Smith (FF), Dawn Perry (FF) and Kurt Krech (FF); Boulder Fire Department volunteer Rob Strong (FF); Bondurant Fire Department volunteer Eric Schneider (FFI); Big Piney/Marbleton Fire Department volunteers Mark Porter (FF), Marcy Setser(FF), Jake Porter (FF) and Adam Porter (FF); and Pinedale Fire Department volunteers Curt Esterholt (FF), Olissio Faverani (FF), Paul Knapp (FF), Darren Koon (FF) and Brent Thomas (FF). Hunt mentioned that Schneider was the first firefighter in Sublette County to become Pro BoardC ertified. Hunt wanted to thank a number of people and departments, including the Wyoming Department of Fire Prevention and Electrical Safety (WDFPES), which governs fire departments across the state of Wyoming. He also wanted to thank Wyoming State Instructor Ken Metzler, Wyoming State Instructor Shad Cooper, Administrative Specialist for training Vonda Huish as well as Certification Coordinator Rita Lee, all of who are with the WDFPES. Dawn Ballou, Pinedale Online! contributed to this article.